Electricity is the main source of power in our homes but must be properly regulated for safety. Overloads of electrical power can result in damage to wires, appliances, machinery, etc., which may result in a fire. But, fortunately circuit breakers are on the job. The idea of a circuit breaker or fuse is to disconnect your home’s internal circuit from the power main when excessive voltage tries to pass through. The main purpose of a circuit breaker is to protect your home and its electrical components from an electrical surge. Breakers provide short-circuit protection as well as overloading of circuit wires which could result in a fire. So how does this work? Every home has a main breaker panel, which will either be a circuit breaker or fuse type. The main difference between the two is that a circuit breaker can be reset and used over and over again while a fuse is a one shot deal that has to be replaced. A fuse is a glass container with piece of wire that is calibrated to allow only a certain level of current to pass through – once a fuse experience current beyond the threshold it will break. If your home experiences a power surge the wire will melt from the heat thereby disconnecting the circuit. A circuit breaker accomplishes the same thing but in a different way in that is allows current to move or pass from a bottom to an upper terminal and across the solenoid or strip. If the current reaches unsafe levels the magnetic force within the switch mechanism is thrown and the current disrupted. What are the advantages and disadvantages of a fuse versus a circuit breaker? A fuse can be improperly replaced with one rated at a higher voltage that may result in an overheated circuit. When a breaker trips or a fuse blows find out what the cause is – many times homeowners either reset the breaker or replace the fuse, which does not address a potential problem. Check to ensure that any one circuit is not overloaded with too many appliances or other electrical devices. Never attempt to modify your panel – always have panel work performed by a licensed electrician. 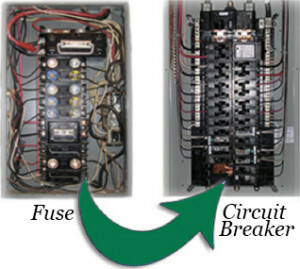 In sum, your circuit breakers or fuse is one of the most important safety mechanisms in your home! If you have added new rooms or electrical outlets you might consider having your service updated if needed. If so, give Gibbons Electric a call to ensure you have the electrical service that is best for you home and family.